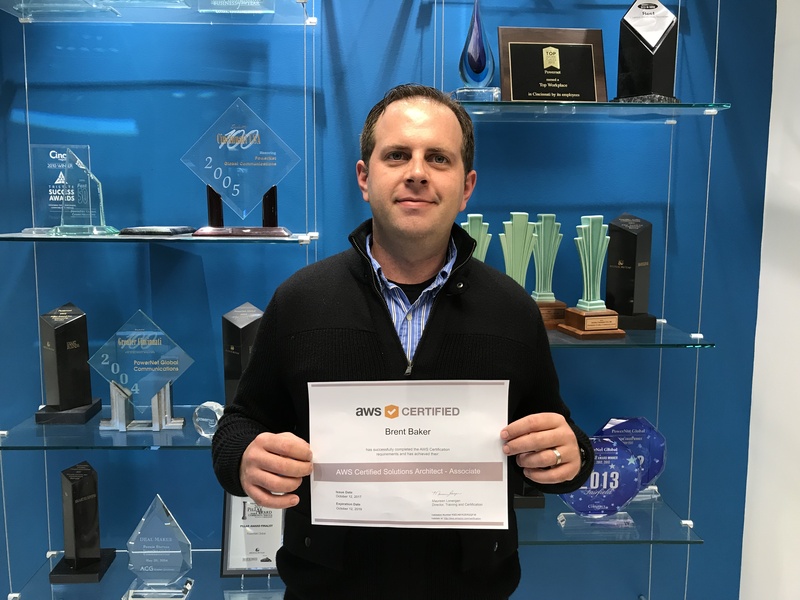 Powernet's Brent Baker acquired his AWS certification for Solutions Architect, bringing greater value to customers while increasing credibility in the channel. Powernet’s Brent Baker, Manager of Network Services, is officially AWS (Amazon Web Services) certified after having completed the Associate Certification for Solutions Architect exam. This certification represents an expert level of knowledge and experience when designing distributed cloud based applications and systems on the AWS web hosting platform. Certified professionals are able to provide a greater value to customers while furthering credibility in the channel. AWS certifications allow professionals to gain technical knowledge on the AWS Platform across several roles and specialties including Solutions Architect, Developer, and Advanced Networking. As more organizations begin their migration to cloud-based services the need for skilled professionals that can develop efficient and cost effective solutions is higher than ever before. By receiving his certification, Baker joins a small but growing number of professionals to become AWS Certified. In order to qualify for the Associate Certification for Solutions Architect, candidates must be able to identify and define requirements for an AWS application while having an in-depth knowledge of a high-level programming language. Candidates must also have at least one year’s experience in designing and deploying successful systems on AWS. Baker plans to pursue additional AWS certifications. Amazon Web Services Certification LogoAmazon Web Services Certification Logo Brent Baker with his AWS Associate Certificate for Solutions Architect.Brent Baker with his AWS Associate Certificate for Solutions Architect.